The Great Lakes Sea Grant Network has released a comprehensive and coordinated outreach and education report on Asian carp in the region. The document includes information on carp life history, movement and behavior, monitoring, control, ecosystem impacts and gaps in current knowledge that need to be addressed further. The report includes listings of available education and outreach materials from the Mississippi and Great Lakes basins that managers and other groups can use to educate stakeholders on the invasive fish. A survey of state and federal agency experts summarizes current research on Asian carp and identifies information still needed to effectively control their spread. Additionally, the report’s list of state speakers allows local interest groups to reach out to experts near them to educate members directly. The plan’s development was funded by the Great Lakes Restoration Initiative through the Asian Carp Regional Coordinating Committee. The final report can be downloaded here. Asian carp is the collective name used for four non-native species of carp from Asia currently found in North America. 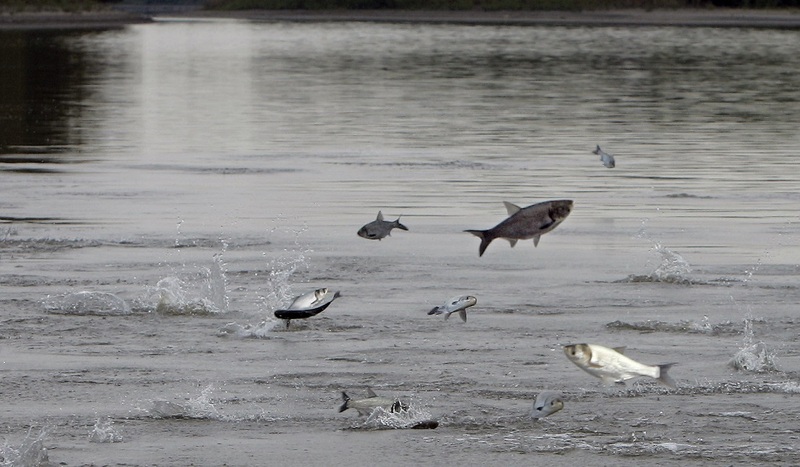 The fish known for jumping out of the water and possibly injuring boaters is predominantly silver carp, which was brought to the United States for aquaculture along with bighead carp, grass carp and black carp. The species most commonly of concern in the Great Lakes are silver carp and bighead carp, which are moving up the Illinois River towards the Chicago Area Waterways System that connects the river with the Great Lakes. The primary concern over Asian carp in the Great Lakes is their impact on an already stressed food web. Silver carp and bighead carp compete with small forage fish and young sport fish for food and could negatively impact the lakes’ fishing industry. Grass carp eat the vegetation that provides prime wetland habitat and black carp feed on mollusks like native mussels, many of which are endangered. At the same time, Asian carp have few natural predators because they quickly outgrow native predator species, often within just a year. In parts of the Illinois River, silver carp and bighead carp make up more than 90 percent of the fish biomass, essentially out competing all native species for food and habitat. The Great Lakes Sea Grant Network is a collaboration of Sea Grant programs along the Great Lakes, which includes Illinois-Indiana Sea Grant, Lake Champlain Sea Grant, Michigan Sea Grant, Minnesota Sea Grant, New York Sea Grant, Ohio Sea Grant, Pennsylvania Sea Grant and Wisconsin Sea Grant. For more information, visit greatlakesseagrant.com.